With hundreds of major credit cards to choose from, it can be hard to determine the best card for your needs. 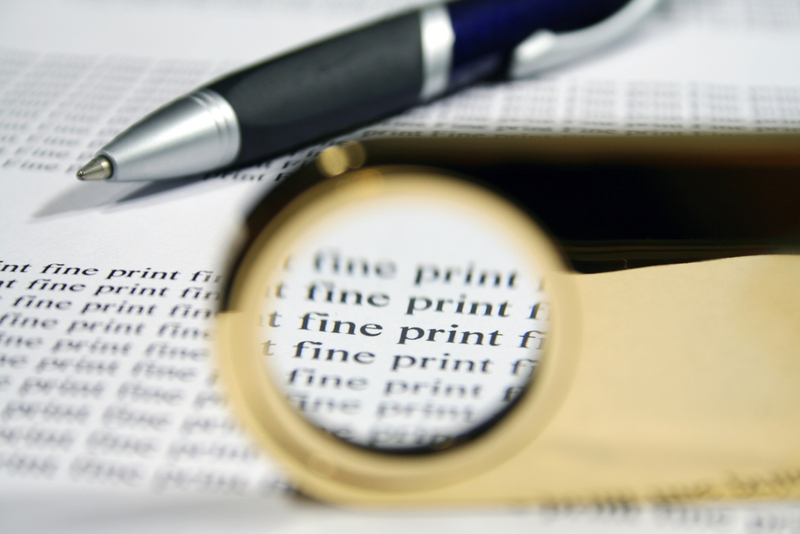 Knowing how to read the fine print is especially important as you select your card, as this information contains important details about rates, fees and even restrictions on credit card reward programs. Next time you’re comparing credit card offers, follow these four tips for reading the fine print. If you’re applying for a credit card online and can’t find these details, look for a small link or section with language similar to “important rates and disclosures,” “interest rates and fees,” or “terms and conditions.” It’s often toward the bottom of the page. One of the most important things to look for in the fine print is the interest rate for purchases, since this is the interest you will pay if you carry a balance. If the credit card offer has a 0% introductory APR benefit, look in the fine print to see how many billing cycles that rate will last, or how many months you get interest-free (for example, 12 billing cycles indicates 12 months). You should also look for the standard APR for purchases, as that’s what you will pay once this introductory period ends. You will only see a range, as your interest rate will be determined by your creditworthiness. If you plan to do a balance transfer from another card, you should also look closely at the APR for transfers because it may differ from the APR for purchases. While plenty of credit cards never have annual fees, many credit card deals feature a $0 annual fee for first year and then start charging one after that. Look in the fine print under the fees section to see if there is an annual fee that kicks in later. You may also want to look under the penalty fees section, which tells you what you’ll owe if you make a late or returned payment or go over your credit limit. If you are going to transfer a balance, look for the balance-transfer fee, which is usually calculated as a percent with a minimum dollar amount indicated. People who travel internationally should also look to see if there is a foreign transaction fee, which is a percentage-based fee you’ll pay on every transaction made with your credit card in foreign currency. Fortunately, an increasing number of credit cards no longer have this fee, but you should always check the fine print. Are you looking at rewards credit card offers? Know that most reward programs have some restrictions. Look closely to see if there are any caps or limits on how many points/miles you can accumulate or how much cash back you can earn. Check the rules for redemption. Additionally, if there is a sign-up bonus such as thousands of airline miles, read closely; there is usually a large minimum amount that must be spent within a short time frame to qualify. Read the fine print illustration via Shutterstock.